Pembrey portraiture studio is situated in Cottenham, 4 miles north of Cambridge and not far from Ely, St. Ives, Huntingdon and Newmarket with plenty of free off-road parking. All photographs are taken in a relax atmosphere by Jeremy Pembrey, an award winning professional photographer with an enhanced DBS. He offers a creative top quality service. The portrait studio is cosy, well equipped with a infinity white background for those popular high key contemporary portraits plus various other backdrops and can accommodate up to 20 people in one group. No pressurised salesmanship to buy, view and purchase your images on line via my 'Viewonline' (password secured) at your convenience, in the comfort of your home. 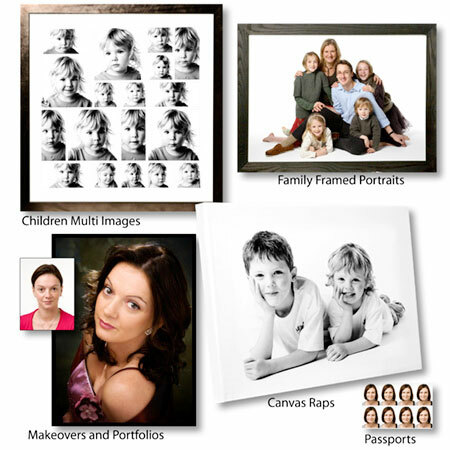 Wide choice of canvas raps, prints or digital files. You only pay for the pictures you really want but be warned you will want the best of them. No hidden costs upfront pricing. Full price list on request. Family portraits, babies and children photos. Sessions last from 20-60 minutes. Unlimited shots taken of any groups, couples and individuals. View and purchase your images on line via our 'Viewonline' (password secured). All countries including, EU, USA, Canadian, Indian, Chinese, Australian, Russian, Finish, Japanese, etc. I can come to your home or venue for family portraits, gatherings, birthdays, anniversaries etc. Internet viewing and purchase. A call-out fee might be required. For corporate, business and social network. Sitting guide. You may wear whatever you wish but smart casual and coordinate groups usually work best e.g. pastel colours, denims and blacks or whites. As a rule try to avoid strong colours or loud designs unless you are all in bright colours. I typically take various combinations of group shots and individuals as full length and close ups, giving you a wide choice of images to make your selection from. If you like you can bring along your own props such as hats, furred hoods, toys, musical instruments etc. for something different but not to be used in every shot. Image enhancement. All images selected by you will be colour and density corrected before printing. You can have selective enlargements, black & white conversion, teenagers spots and other temporary blemishes removed at no extra cost.